Rob founded the Summit Coffee Songwriters Showcase in June 2010 at Summit Coffee in Historic Downtown Davidson, NC. located on the eastern shores of Lake Norman. The monthly event is held in the round on the secondthursday of each month at 7pm. The Showcase features the best local, regional, and touring artists performing their original songs in a listening environment. Artists have performed our stage from as far away as Marth’s Vineyard, MA – Toronto, CA – Ann Arbor, MI – Savannah, GA – Nashville, TN, etc. The Showcase is presented in the 45 seat listening room upstairs and seasonally on the outdoor stage. The event features 3 artists on stage seated. Rob will normally play the event with two guest artists and sometimes and opening guest artist. 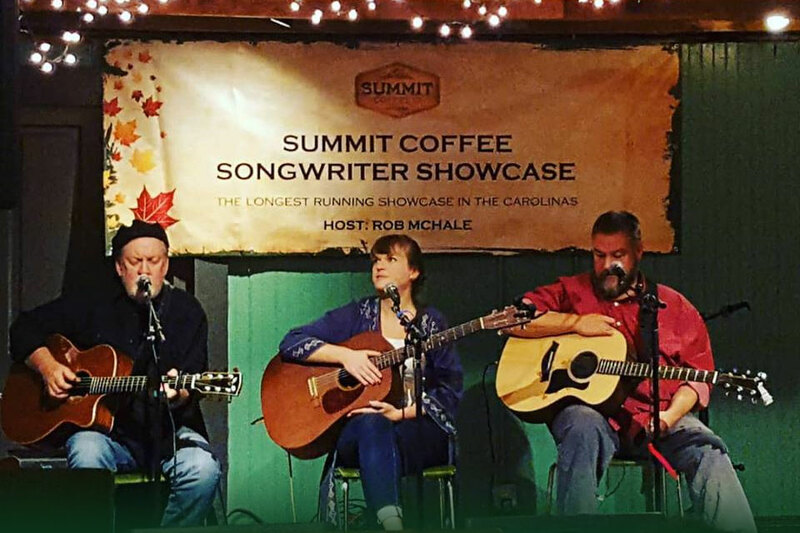 The event has become a popular destination for artists and fans to hear original acoustic Folk music and is the longest running songwriter showcase in the Carolinas.